The following letter has been published in Veterinary Times this month, and today we received an email from a vet asking about the availability of VacciCheck. If vets can be persuaded to perform titre tests, rather than revaccinate already immune dogs and cats, then our dogs and cats are going to be very much healthier. There seems to be a constant stream of media stories surrounding dog attacks on both adults and children in the UK. Some of these will no doubt be due to the way in which the dogs are treated by humans: a lack of training and socialisation, poor diet, cruelty, and so on. However, we are concerned that one potential cause is being overlooked. Vaccines are known to cause neurological effects. 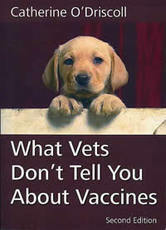 Are veterinarians aware of this, and are they examining the vaccination records of dogs exhibiting sudden unprovoked aggression? The WSAVA has repeatedly called for vets to reduce the antigenic load, and to stop annual vaccination so as to minimise unwanted sequelae. Neurological effects may be thought to be uncommon (although they are likely to be vastly under-reported), but any reaction which leads to the maiming or killing of a human being and the destruction of the dog is surely unacceptable – especially when the vaccine was not needed. Kennel cough and leptospirosis vaccines are deemed ‘non-core’ or ‘optional’, and the world experts say that they should only be used if there is a known disease threat in the area. Yet it seems that UK vets believe that the leptospirosis vaccine, with its short-term efficacy, is an annual necessity. This vaccine is known to stimulate the most severe side-effects. One must weigh the risks and benefits: how prevalent is leptospirosis in the UK? No-one seems to know. Industry sales data is not a reliable source. Where are the official statistics for this zoonotic disease? Think: if leptospirosis and Weill’s Disease were that common, an official database would exist somewhere, and yet it does not. Do the potential unwanted effects of the leptospirosis vaccine – which can include brain damage – justify the vaccine’s use where no or little disease threat exists? During 2013, the Pet Welfare Alliance wrote to every veterinary practice in the UK with the above facts, plus vaccine adverse effects references. We negotiated a discount for veterinary practices against VacciCheck, the in-house titre testing kit. Titre testing can mitigate vaccine booster loss. Vets need to be aware that vaccinating is not the same as immunising, which is why vaccinated dogs succumb to viral and bacterial disease. Only the presence of circulating antibody can confirm immunity, and only the absence of circulating antibody can justify revaccination. We have so much to thank the veterinary profession for. By updating vaccination policy, we will have much more to thank them for. First do no harm. 15. Ballerini, Rico B et al., Neurological Complications of Vaccination With Special Reference to Epileptic Syndrome Riview Neurol, Jul-Aug 1973; 43: 254-258. 16. Wisniewski, H.M.; Sturman, J.A. ; Shek, J.W. Chronic model of neurofibrillary changes induced in mature rabbits by metallic aluminum. Neurobiol Aging. 1982, 3(1), 11-22. 17. Pendlebury, W.W.; Beal, M.F. ; Kowall, N.W. ; Solomon, P.R. Neuropathologic, neurochemical and immunocytochemical characteristics of aluminium. Neurology. 2008 May 6; 70(19):1672-7. 18. Petit, T.L. ; Biederman, G.B. ; McMullen, P.A. Neurofibrillary degeneration, dendritic dying back, and learning-memory deficits after aluminium administration: implications for brain aging. Exp Neurol. 1980, 67(1), 152-162. 19. Petrik, M.S. ; Wong, M.C. ; Tabata, R.C. ; Garry, R.F. ; Shaw, C.A. Aluminum adjuvant linked to Gulf War illness induces motor neuron death in mice. Neuromolecular Med. 2007, 9(1), 83-100. 20. Gherardi, R.K.; Coquet, M.; Cherin, P.; Belec, L.; Moretto, P.; Dreyfus, P.A. ; Pellissier, J.F. ; Chariot, P.; Authier, F.J. Macrophagic myofasciitis lesions assess long-term persistence of vaccine-derived aluminium hydroxide in muscle. Brain. 2001, 124(Pt 9), 1821-1831. 21. Shaw, C.A. ; Petrik, M.S. Aluminum hydroxide injections lead to motor deficits and motor neuron degeneration. J Inorg Biochem. 2009, 103(11), 1555-1562. 22. Golub, M.S. ; Gershwin, M.E. ; Donald, J.M. ; Negri, S.; Keen, C.L. Maternal and developmental toxicity of chronic aluminum exposure in mice. Fundam Appl Toxicol. 1987, 8(3), 346-357. 23. Redhead, K.; Quinlan, G.J. ; Das, R.G. ; Gutteridge, J.M. Aluminium adjuvanted vaccines transiently increase aluminium levels in murine brain tissue. Pharmacol Toxicol. 1992, 70(4), 278-280. 24. Struys-Ponsar, C.; Guillard, O.; van den Bosch de Aguilar, P. Effects of aluminum exposure on glutamate metabolism: a possible explanation for its toxicity. Exp Neurol. 2000, 163(1), 157-164. 25. Cohly, H.H. ; Panja, A. Immunological findings in autism. Int Rev Neurobiol.2005, 71, 317-341. 26. Banks, W.A. ; Kastin, A.J. Aluminum-induced neurotoxicity: alterations in membrane function at the blood-brain barrier. Neurosci Biobehav Rev. 1989, 13(1), 47-53. 28. Department of Paediatrics, Tokyo Medical University, Japan, found the measles virus in patients with inflammatory bowel disease and autism. (Dig Dis Sci, 2000, Apri; 45(4) 723-9) . The sequences obtained from the patients with ulcerative colitis and children with autism were consistent with vaccine strains. It should be remembered that the measles virus and canine distemper are very closely related.